New Flavors: StarKist Creations - We're borderline obsessed with StarKist's perfectly portioned pouches of flavored tuna, and these latest flavors are incredible! Try the new Kid's Creations line in Bacon Ranch and Honey BBQ (tasty for all ages), the Tuna Creations in Hot Buffalo Style, and the Salmon Creations in Mango Chipotle and Lemon Dill. No joke: We love them all. Each 2.6-oz. pouch has 70 - 110 calories, 0.5 - 5g fat, 300 - 620mg sodium, 0 - 4g carbs, 0 - 1g fiber, 0 - 3.5g sugars, and 13 - 15g protein (PointsPlus® value 2 - 3*). Stock up! Fiber One Limited Edition 90 Calorie Soft Baked Pumpkin Bars - OK, pumpkin, you're off the bench! This new dessert bar is just the kind of thing we crave in the autumn months. Each bar has 90 calories, 2.5g fat, 85mg sodium, 18g carbs, 5g fiber, 9g sugars, and <1g protein (PointsPlus® value 2*). We spotted them at Target; you can also order 'em via Amazon. Cauliflower Is the New Black: Products & Recipes! Trader Joe's Organic Riced Cauliflower - This breakout product disappeared from shelves almost immediately after it made its debut, and we've been sad ever since. It would save us so much time ricing our own cauliflower! Well, good news... Word is that it'll be back in freezer cases by the end of next month. We can't wait! Recipes Galore! Some of our latest obsessions are pizzas made on a cauliflower crust, cauliflower paella, and (of course) cauliflower fried rice. Coming next month? Casseroles and burrito bowls! 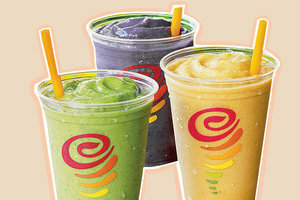 Have you heard about Jamba Juice's new Almond Milk Smoothies? They're full of healthy ingredients and great for dairy avoiders, but that doesn't mean they're automatically low in calories. The lightest pick is the 16-oz. Pumpkin smoothie, with 200 calories and 3g fat (PointsPlus® value 5*). The heftiest flavor is Peanut Butter & Berries; the 16-oz. 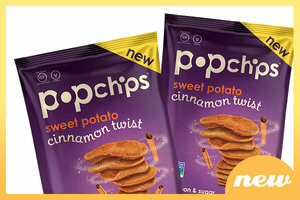 size has 330 calories and 11g fat (PointsPlus® value 9*). Food for thought… Make that sips for consideration! ***It's probably not shocking to hear that a high-fat diet can lead to obesity, but one of the reasons why is a little more surprising. According to a new study, fatty foods actually trigger our brains to want to overeat -- specifically, to overeat more foods high in fat. Those of us familiar with the cheat day that turns into a cheat week can surely relate. Click for some tips on how to get back on track. ***Enough serious talk for today. If you love bacon, but hate to eat it alone, Oscar Mayer has developed your perfect dating app: Sizzl. That's right, find the perfect person to share these recipes with; just make sure to stock up on center-cut or turkey bacon first! And that's all we've got. 'Til next time… Chew the right thing! Today, September 28th, is National Drink Beer Day. Having a light beer is hardly gonna break the calorie bank, with an average of 100 calories per bottle. Just don’t overdo it, and drink responsibly! Any cauliflower-crazed buddies out there? They need today's news -- click "Send to a Friend" now.